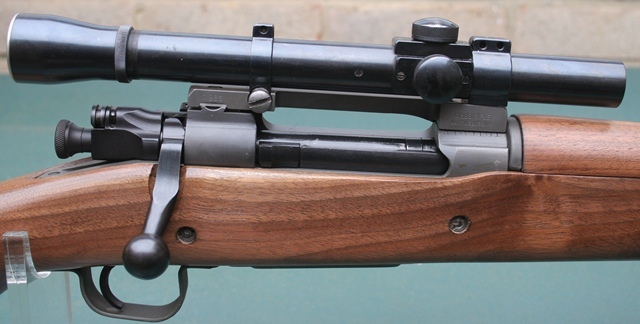 This was originally a Gibbs 1903A4 Sniper rifle that I rebuilt because the Gibbs donor rifle was poorly built and the replica scope was abysmal. 1903A3’s are difficult and expensive to source, so therefore finding a Gibbs donor rifle is a financially attractive option. 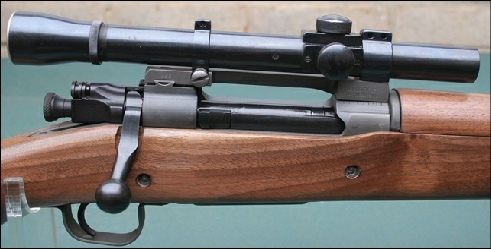 This rifle was originally a 1903A3, fitted with a new barrel and made up from parts by Gibbs. It has been refitted with an original 1903A3 stock, Timney trigger and after some experimentation an original Lyman Alaskan 2.5 scope. The stock has been bedded and the Gibbs scope base, shimmed and refitted to ensure it is parallel with the bore. 2.5 magnification scopes have poor capabilities therefore it is possible to fit 1” rings to permit similar scopes with x4 or greater magnification. The rifle was tested at 100 yrds with factory ammunition and achieved a 2” group. The was re-shot using reloads at the same distance and achieved a group of 1”.